BRAND NEW TO THE VACATION RENTAL PROGRAM! "Kickin' High Lodge", this fabulous custom log home provides the perfect mountain retreat that welcomes guests with it's unique charm and leaves them with a longing to return. The home sits high in the mountain tops which account for the stunning views of the Rich Mountains. 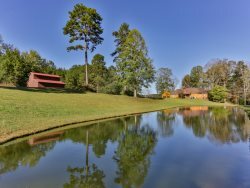 Located in Blue Ridge and being only 7 miles from the Aska Adventure Area and minutes from the Appalachian Trail, it makes for the perfect place to vacation with family and friends or to impress colleagues for a great corporate retreat. Don't be surprised if you find yourself not wanting to leave this property at all! Excitement starts building as you drive up the gentle incline to your destination. When the home comes into view there is usually one word that comes to mind......WOW! And it doesn't stop here! Walk into the foyer with beautiful slate floors for another breath of fresh air. Everywhere you look, this home screams, welcome, enjoy, kick back and stay a while! With gorgeous furnishings that flaunt a luxurious southwestern abode, you will immediately begin to relax and relish in the beauty of your surroundings. With 5 gas fireplaces scattered throughout the home, the desire for some cozy ambiance on a cool mountain evening is at your fingertips. Relax on one of the large decks enjoying the abundant wildlife in this area or watch a beautiful sunset from the unique rock balcony with that special someone. At the end of a great day, perhaps a long soak in the large luxurious hot tub will be just what you need before bedding down for a great night's sleep. So don't wait, grab some grub, pack your saddlebag and come on up to Kickin' High Lodge where life is good and memories are waiting to be made! The home is beautiful and perfectly situated on the mountain top. Our family had a great stay at the lodge. May visit the area next Christmas!! The cabin was beautiful, the view was astounding so much peace. Beautiful house with nice amenities , nicely kept and clean. Natural beauty surrounds. We had a wonderful week hiking, spending time with our family and dogs.